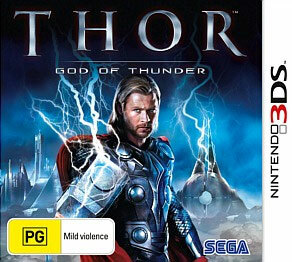 Thor God of Thunder 3DS Review. If you're looking for something non-draining on the brain than Thor - God of Thunder offers 3DS gamers a fun yet ultimately forgettable journey for this ancient god. The hit Hollywood blockbuster based on the Marvel comic hammers its way onto the Nintendo 3DS which places the gamer in the shoes of Asgard's very ownThor, the god of Thunder! Loosely based on the movie with the same name, players must engage in an almost God of War epic as they smash their way through an almost never ending line of enemies. Even though the story definitely takes a back seat in this game, thankfully the relatively "safe" gameplay allows you to soldier on. Thor - God of Thunder is not the most original game in the world but if you're looking for a relatively mindless button masher, then you've come to the right place. 3D even works well which is a bonus. As mentioned, the game is reminiscent of the God of War series but opposed to the god killer Kratos, gamers control Thor who is once again being unwittingly dragged along by his brother Loki. The control system on the 3DS works well enough as you use the circle pad to move the character around with the face buttons (X, Y, A & B) used to engage in the enemies, the environment and to jump around. Apart from walking around, Thor can also dodge and perform a hammer dash to not only move faster but damage any enemies in his way. Your normal attacks include quick attacks and power attacks such as sweep and uppercut. 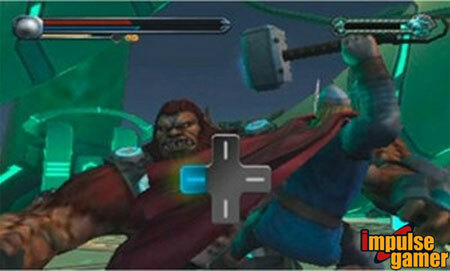 As you do progress in Thor, this opens up a variety of upgrades for Thor which in turn create more powerful attacks. By collecting runes, these allow you to perform these special attacks. You can even unlock some new Thor costumes that are taken directly from the Marvel comics as another incentive to keep on fighting. Enemies at first are quite lacklustre in the game as you fight way through too many Frost Giants with the highlight being the occasional boss battle. Fortunately as you progress, you do explore new worlds that include other enemies such as Trolls and creatures from Norse mythology. 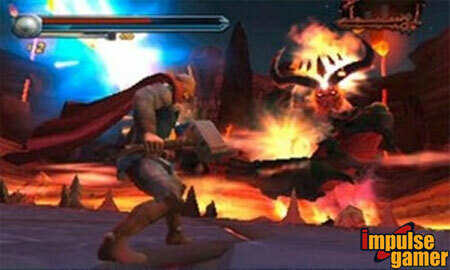 For comic geeks, you can even battle Ulik, Ymir and Surtur. Thor does have a health bar and by defeating enemies, they drop orbs which when collected are used to replenish your health and fortunately there are plenty of save points along the way. 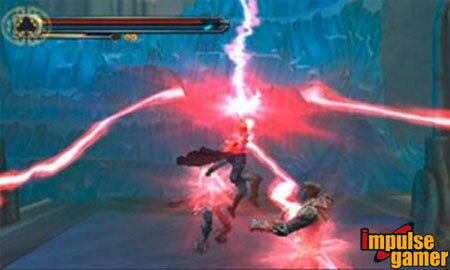 Combat generally revolves around the Mjölnir, the hammer of Thor which can be used as a melee or ranged weapon. 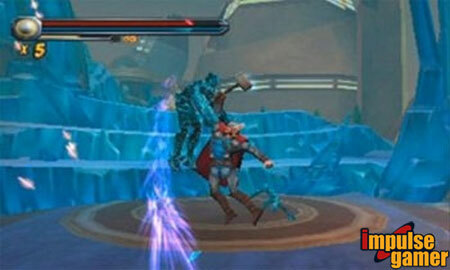 The Mjölnir can also be used as a shield when Thor spins it around at high speed that can also reflect projectiles. Every now and then, depending on how many runes you've collected, Thor can unleash a powerful attack on his enemies and this is simply achieved by pressing the touch screen and selecting one of your special attacks. His special attacks are based on the elements that include thunder, lighting and wind which look graphically quite impressive. Certain fights will also require you to perform some quick time event such as pushing the right shoulder button, down on the d-pad and then Y. If you fail to pull off one of these moves, you basically need to knock down your enemies health again and try again. The only tricky aspect of the gameplay was the relatively fixed camera angle that sometimes got in the way, especially when you were backtracking. As you can see, the gameplay doesn't break any moulds but ironically, it's good old fashioned button mashing fun. Graphically, the title looks decent on the 3DS and some of the 3D effects really jump out of you. The special effects are a treat and most of the characters are well animated. It's just a shame that some of the camera angles get in the way and at times, the characters look a little small, depending on which level you are playing. Music is forgettable but the voice acting is actually quit decent for a movie based game as are the sound effects. If you're looking for something non-draining on the brain than Thor - God of Thunder offers 3DS gamers a fun yet ultimately forgettable journey for this ancient god.